The bridge is about connection. It is unique because it was built in multiple levels and sections for different uses. It stands high above the Cuyahoga River as a symbol for the city of Cleveland and its long industrial history. The basis for this design encompasses all of those ideals. The lower level of the bridge, once home to subway traffic and later phased out by the automobile, will be revived through the creation of mixed-use spaces for public transit, a pedestrian walkway, and commercial spaces. 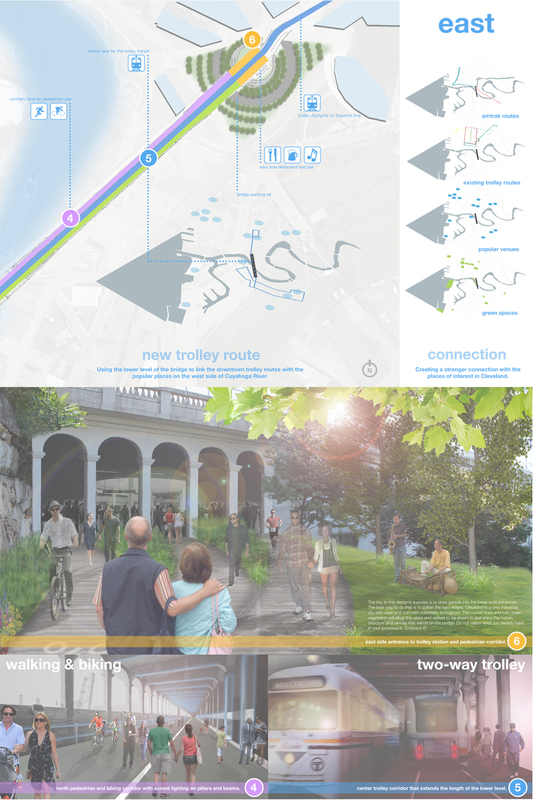 This design advances ClevelandÕs growing public transit system and further strengthens the cityÕs commitment to sustainability. Above ground trolley entrances allow easy access for people to hop on and experience the bridge the way it originally was. Commercial and retail opportunities local to Cleveland located on the lower level will bring renewed growth and activity as well as music venues, restaurants, and bars. 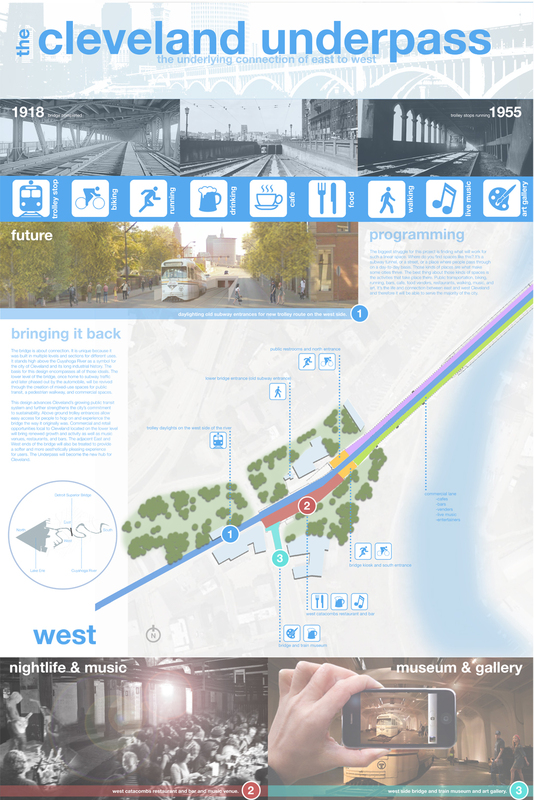 The adjacent East and West ends of the bridge will also be treated to provide a softer and more aesthetically pleasing experience for users. 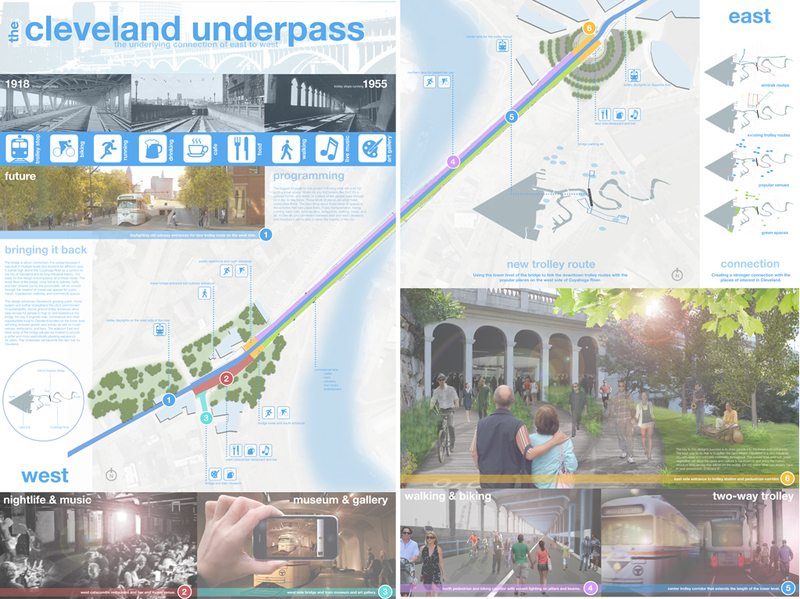 The Underpass will become the new hub for Cleveland.